Kindergarten Enrollment has been declining in Texas public schools since its peak in October 2013. The decline cannot be attributed to any one factor; however, a likely influence is the statewide birth decline spawned by the Great Recession—that first began in 2008 and continued through 2011. According to data from the Texas Department of State Health Services, there were 407,453 live births recorded in the State in 2007. In 2009, 401,599 live births were recorded in Texas, and by 2011, the statewide tally was 377,274, a 7.4% decline from 2007. Population and Survey Analysts (PASA) uses birth statistics to conduct a trend analysis for every school district client to project enrollment for incoming Kindergarten classes. 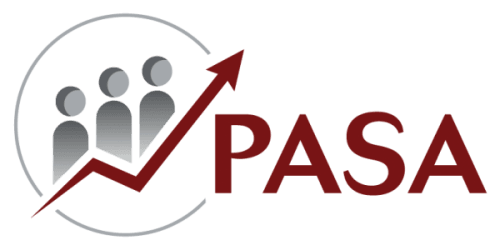 PASA has adjusted birth data five years forward so that Kindergarten enrollment can be aligned with the year of birth of the Kindergarten class. 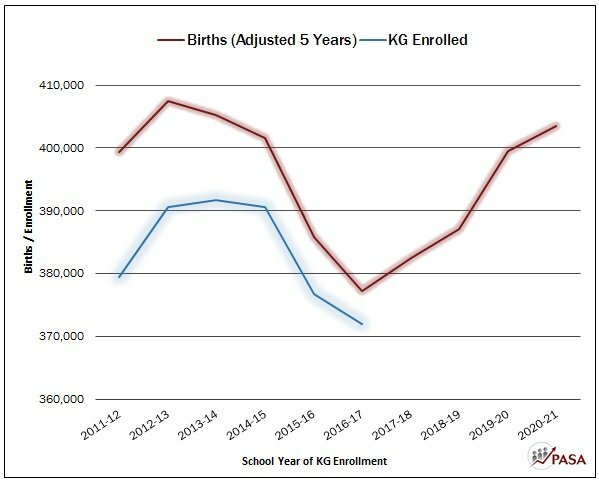 Statewide, the decline in births mirrors the total enrollment in Texas public schools and is illustrated on the chart above. The chart clearly shows that Kindergarten enrollment has a direct correlation with the number of births from five years prior. Statewide, Kindergarten enrollment in Fall 2016 was the lowest in the last five years. However, beginning in 2017 and continuing into the near future, Kindergarten enrollment in Texas is likely to rise, as the number of births has increased since 2013. Kindergarten enrollment may be expected to do the same in certain school districts. Regional differences in birth trends exist and can also vary depending on where a school district is located within a Metropolitan Statistical Area (MSA). PASA has compiled birth data on both urban and suburban school districts in the five most populated MSAs in Texas. All Metro Areas saw declines in the number of births five years ago and most all school districts have been facing smaller Kindergarten class sizes. In all Metro Areas, suburban births have increased and will likely lead to larger Kindergarten class sizes again soon. The Houston suburbs have seen a dramatic rise in births likely due to the economic boom years seen in this Metro in 2012–2014. Urban school districts, however, are not all experiencing the same increases in births. Since 2013, urban districts in Houston and San Antonio saw significant gains in births. In contrast, El Paso ISD is experiencing a recent decline in births and urban school districts in Austin and Dallas-Fort Worth have experienced nearly flat growth and have not recovered from the birth decline in the early 2010s. The continued demand for urban living is changing the demographics of cities such as Austin, Dallas, and Houston. Each city draws a slightly different lifestyle and demographic, but generally they are attracting both the young millennials and older empty-nesters who desire to be closer to urban amenities. For example, Austin’s vibrant cultural and economic landscape has been attracting both younger millennials, a generation known to delay having children, as well as an older population. Both groups have likely stunted the urban core’s school-aged population. Millennials buying homes are also more likely to have fewer children. Nationwide in 2015, 46.7% of households led by a householder between the ages of 25 and 34 had children under 18 years of age living in the house. This is down from 51% in 2011 according to the U.S. Census Bureau’s American Housing Survey. The National Association of Realtors reports that 21% of homeowners without children choose condos and townhomes in denser urban areas. For households with children under 18, only 10% choose to buy attached single-family housing—which are typically located in the urban core. Many of Houston’s original suburban neighborhoods that are now considered part of the urban core have seen a renaissance as parents are choosing to live closer to work and send their children to highly rated public and private schools. On the other hand, the vast majority of those buying homes who have children – 90% – are buying detached single-family homes which implies more of a general interest in suburban homes in suburban school districts (National Association of Realtors’ 2016 Profile of Home Buyers and Sellers). School districts with more detached single-family housing have greater appeal to young homebuyers than more compact, urban housing that tends to attract households without children. As the cities of Texas mature, these demographic changes will affect student enrollments in different ways depending on the geographic boundaries and housing composition of each school district.